KODIAK, Alaska, June 10, 2012 (ENS) – A U.S. Army Reserve landing craft hit a submerged rock south of Kodiak Island in Chiniak Bay on Friday night. To keep the vessel from sinking, the crew of the 174-foot Monterrey deliberately beached the vessel on Puffin Island, where it leaked diesel fuel Saturday, according to the U.S. Coast Guard. The Coast Guard estimates more than 15,290 gallons (485 barrels) of diesel spilled into Chiniak Bay from two breached fuel compartments aboard the Monterrey, a landing craft with the 481st Transportation Company based in Vallejo, California. The Monterrey was transportating heavy construction equipment and supplies from Port Hueneme, California, to Bethel, Alaska in support of a U.S. Marine Corps. 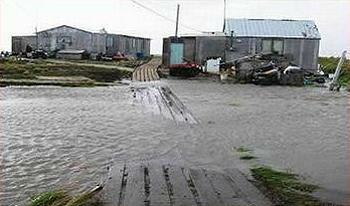 mission to move a native Alaskan village that is sinking due to climate warming of its permafrost foundation. Coast Guard personnel are coordinating with the Army Reserve, the Alaska Department of Environmental Conservation, the not-for-profit oil spill response organization Alaska Chadux Corporation, and other stakeholders in response to the spill. The Monterrey was reportedly carrying up to 40,000 gallons (1,269 barrels) of fuel on board. Response teams are exploring the possibility of bringing in skimming vessels to clear surface fuel. Two booms have been put in place around the Monterrey to contain the spilled fuel, and a third boom is being placed at the mouth of the Buskin River, an environmentally sensitive area. The Buskin River is one of the most productive fisheries on Kodiak Island. Visitors from around the world visit the river to fish for sockeye and coho salmon and watch brown bears, eagles, harlequin ducks, and harbor seals. Coast Guard personnel responded to a mayday call from the crew of the Monterrey after they struck an object and began taking on water in Chiniak Bay at 10:16 pm on Friday. A Coast Guard Air Station Kodiak helicopter crew launched at 10:44 pm, carrying dewatering and rescue equipment to the scene. Good Samaritans aboard two fishing vessels also responded to assist. One of these vessels transported two crewmembers with minor injuries from the Monterrey to emergency medical services in Kodiak. The circumstances of the Monterrey’s collision are under investigation, according to the Coast Guard. According to the Army Reserve, the construction equipment aboard the Monterrey was intended for use on a federal project to move the villagers of Newtok to Mertarvik, about nine miles away. The permafrost foundation under Newtok is crumbling, melting and eroding as Alaska’s climate heats up, making the village uninhabitable. Newtok, a Yupik village of about 400 people, lies on the Ninglick River near Alaska’s west coast, 400 miles from the nearest road. Alaska’s climate is warming at more than twice the rate of the rest of the United States. More than 200 Native Alaskan villages have problems with climate change-related impacts such as erosion, flooding, storm surge, and thawing permafrost. At least 12 villages have decided to explore relocation.